The circle shows the location of the class G star 55 Cancri (in the constellation Cancer), also known as Rho-1 Cancri (the "55" a Flamsteed number). The circle is actually centered on two stars that are not separated at the photo's resolution. The eastern one is 55 Cancri, the western 53 Cancri. (The bright body is our own Jupiter, which was passing through Cancer when the picture was taken.) Five planets are now known to orbit 55 Cancri (Cnc), making it appear rather like our own Solar System. In addition, the star has a distant red dwarf companion. 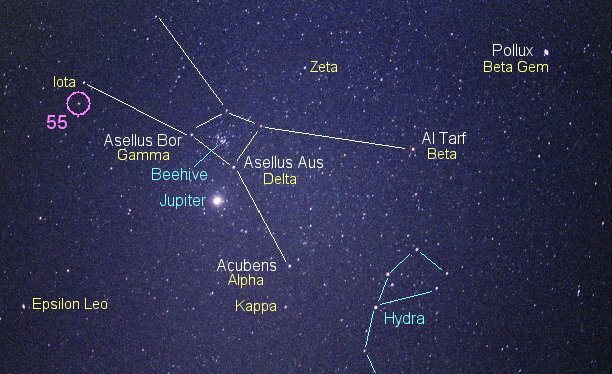 The planets are labelled "b" through "f" (where "A" is the star) in order of discovery. Farthest out, at 5.76 Astronomical Units (AU) from the star, is the most massive, 55 Cnc-d, which is at least 3.8 times the mass of Jupiter and takes 14.3 years to orbit. The other four are much closer and less massive. Next closest in order are 55 Cnc f, c, b, and e with minimum masses of 0.14, 0.17, 0.82, 0.027 Jupiters, orbital radii of 0.78, 0.24, 0.115, 0.0156 AU, and periods of 260, 44.3, 14.7, and 0.7365 days (just 17 hours and 24 minutes). 55 Cnc-e has the smallest measured minimum mass, only that of 8.6 Earths, less than 2/3 or that of Uranus or Neptune, its orbit just 4 percent the size that of Mercury. This innermost planet is close enough to transit its star. From the drop in intensity, we find a radius of between 0.6 and 0.8 times that of Earth, which makes this "superearth" remarkably dense, at the lower limit perhaps as dense as iron. 55 Cancri is a mid-sixth magnitude star (magnitude 5.95) class G (G8) dwarf 41 light years away. A bit cooler (5280 Kelvin) and carrying just under a solar mass, it shines at just 58 percent of the luminosity of the Sun, its radius 0.9 solar. Like most stars with planets, 55 Cnc is rich in metals, its iron content (relative to hydrogen) quite high, twice that of the Sun. 55 Cancri is also a double star . Moving along with it through space is a dim 13th magnitude (13.7) class M red dwarf (probably M6) that is at least 1040 AU away and takes at least 30,000 years to orbit. From 55 Cancri's planets, the neighbor would shine somewhat dimmer than Venus at her maximum as seen from Earth. Written by Jim Kaler, last revised 7/29/11. Return to The Planet Project or go to STARS.